Wild Women of the Universe! : What's Up With the Energy? What's Up With the Energy? One of my friends/clients (I'll call her as "L") left me a message saying, "I was wondering if energetically there is something going on right now and why there is so much turmoil? Can you pull a card for the universe and see what's going on with the energy? " The card I selected was the Six of Swords from Ciro Marchetti's Gateway to the Divine Tarot deck. This card symbolizes a journey or a transition from one way of life to the next. On a grand scale (collective energy), this type of transition could result in the universal energy feeling erratic and somewhat funky, which may be what "L" was talking about. Maybe you've outgrown parts of your life and it is time to leave that behind. This may be a slow transition...so gradual that you hardly notice it, or it might feel sudden...like when you were growing up and one day your clothes would fit fine and the next, your pants would feel tight or be too short. Possibly you are outgrowing who you have been and are ready to step into "more" whatever that may be. Liminal is the word that comes to mind, which refers to the space in between. According to Wikipedia, liminality comes from the Latin word, limen, which means "a threshold. "It continues: "Liminality is the quality of ambiguity or disorientation that occurs in the middle stage of rituals, when participants no longer hold their pre-ritual status but have not yet begun the transition to the status they will hold when the ritual is complete. During a ritual's liminal stage, participants "stand at the threshold" between their previous way of structuring their identity, time, or community, and a new way, which the ritual establishes." 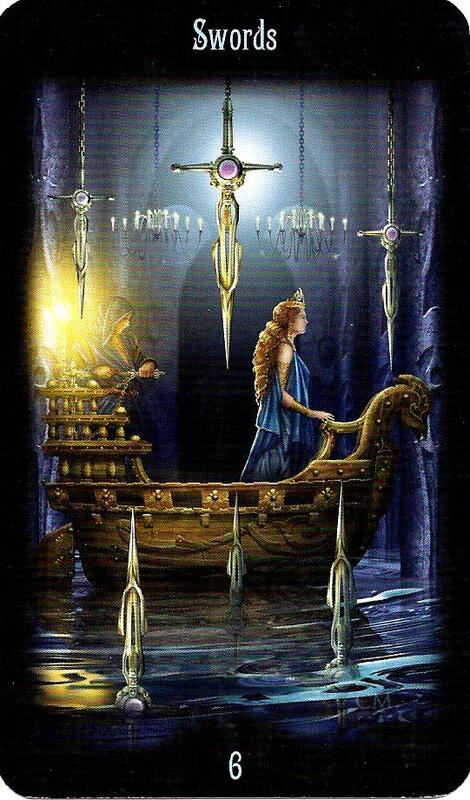 If you feel restless or feel that something is "off," the Six of Swords indicates that you are in between "life as you have known it" (where it is comfortable, safe and somewhat predictable) and "something new and different" (which might feel intimidating and/or exciting). You are standing on the threshold to your new life...and may be experiencing a mix of emotions that might include both grief and/or relief for what you are leaving behind as well excitement and/or possibly anxiety about what lies ahead. The Six of Swords not only recognizes these confusing feelings, but reassures you that moving ahead is your best bet. Key words here are "brighter days ahead." So recognize that you are in the liminal space (on the threshold between the old and the new) and keep moving forward, honoring where you have been, but also preparing yourself as you grow into the future...with both an open mind and an open heart. I like the concept of liminal, and that I may be on the threshold of something new and exciting. It's a helpful way to make sense of recent events. I've missed you writing here -- good to see you here! I know this Liminal space. Not very comfortable, but moving ahead seems the right thing to do.